So you are ready to book your next vacation. You might be wondering what website to use to get the best deal. Of course you will probably check popular online travel agencies like Expedia, Hotwire, or Orbitz. But did you know you can book an entire vacation package through American Airlines? 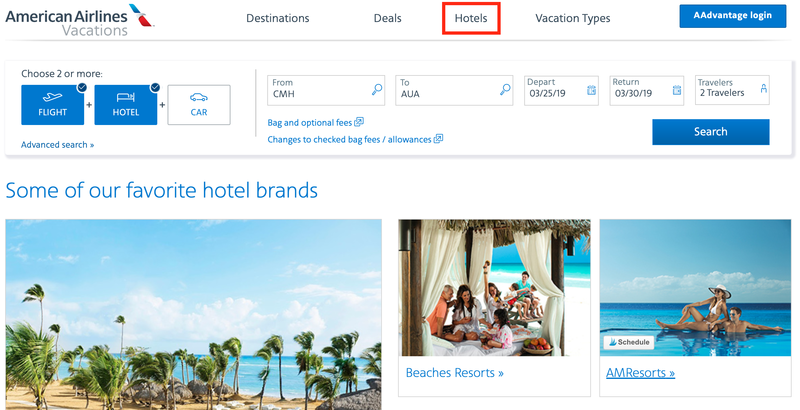 I’ll take you through the process here to show you the benefits and drawbacks of booking a vacation through American Airlines Vacations. Why Book With American Airlines? There are so many places to book vacation packages these days; you might be wondering what makes American Airlines Vacations different. Let’s go over some of the key benefits that AAVacations offers. 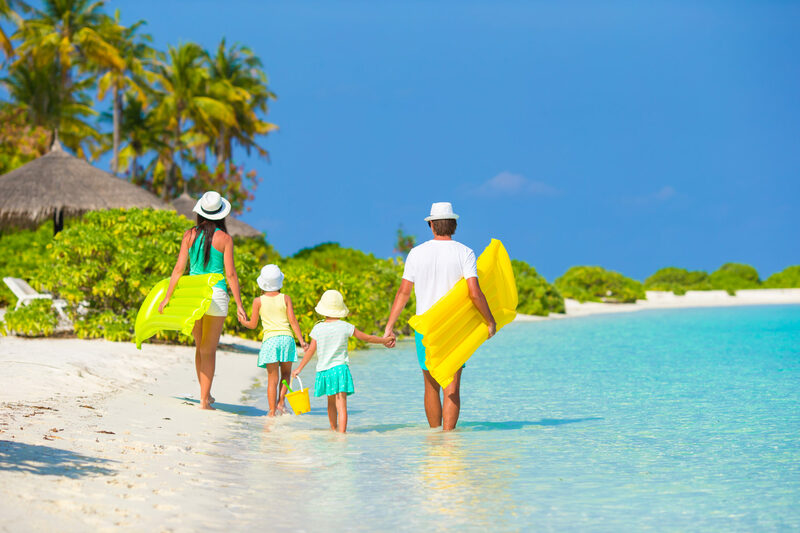 You can book your whole vacation including flights, hotel, rental car, and activities through American Airlines Vacations. Image courtesy of aavacations.com. Booking a vacation package is a pretty good way to save money. I have compared prices of lots of packages on many websites, and more often than not they do save a good chunk of cash. We love earning miles here at Upgraded Points, and you will definitely earn AA miles when you book an AAVacations package. Bonus miles will be awarded to the first traveler’s AAdvantage account. Be sure to include your AAdvantage member number at the time of booking. Bottom Line: Every booking through American Airlines Vacations earns 1,000 bonus AAdvantage miles. 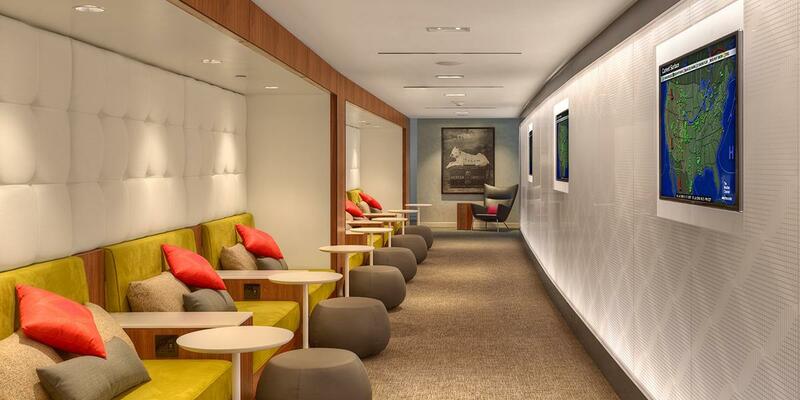 Some packages include hotels that offer up to 30,000 bonus miles. However, you won’t earn miles on any package that is fully or partially paid for using AAdvantage miles. 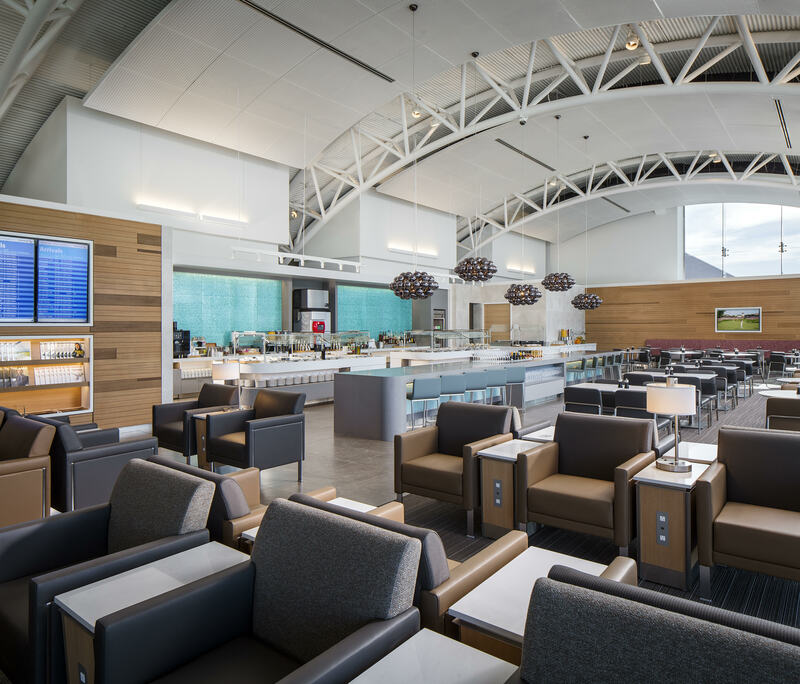 Don’t forget to use an American Airlines credit card when making the booking, or a rewarding travel card like the Chase Sapphire Preferred® Card or Chase Sapphire Reserve to earn even more miles for each $1 that you spend on an AA vacation! American Airlines Vacations offers payment through Uplift, a monthly payment plan service. Uplift breaks your payments into 12 increments. Don’t get too excited here. While it might be nice to pay for your trip over time, Uplift charges interest, so you end up paying more than you have to. You can pay for any portion of your vacation package using AAdvantage miles! Every mile equals 1 cent when booking a vacation package. All miles must come from 1 account, so unfortunately you can’t pool your points with your travel companions. You also will not earn AAdvantage miles on bookings you pay for with miles. Use the slider to determine how many miles you want to use. If you choose to pay for part of your package with miles, you must use a minimum of 1,000 miles. Bottom Line: When redeeming AAdvantage miles for a vacation package, you will get 1 cent per mile in value. American Airlines Vacations offers support while you are booking and during your trip. Now that you know some of the benefits of booking a vacation through American Airlines, you need to know where to find them. From the American Airlines homepage, click on Plan Travel in the main search bar. Then click on Vacations in the drop-down menu. Or you can go directly to aavacations.com. Vacation packages can be booked over the phone, but they could include a fee of $35 per person. 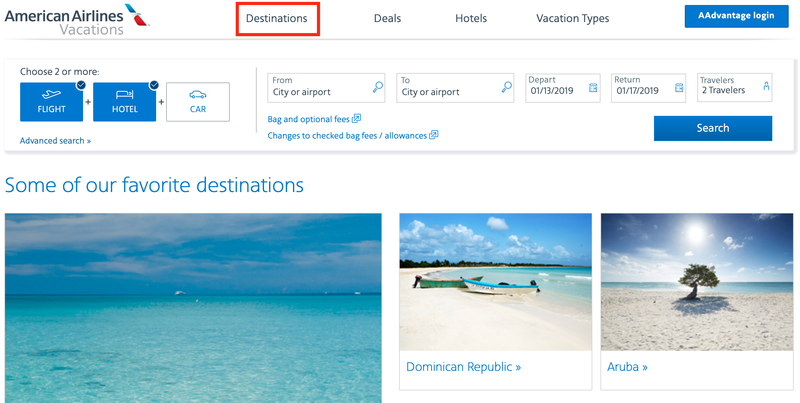 From the American Airlines Vacations homepage, you will notice a search box in the middle of the page. Here you can search for a vacation package using any combination of flight, hotel, and/or car rental. After you input your destination and dates of travel, click on Search. Your search results will be front and center with basic filtering options to the left. The first thing you might notice is that there are a few different prices listed. Under the hotel information, you will be able to see additional information like any resort fees or extra discounts being offered. The price you see is for a base level package. If you choose a different room, flight, or car type your price could increase. Each time you have multiple options, you will be able to see if the price is higher for each selection. If a price says +$0.00, then that option is included in your quote. Once you choose the first part of your package (hotel, flight, or car), you will be guided through to select the other parts. Don’t forget to pay attention to the price. 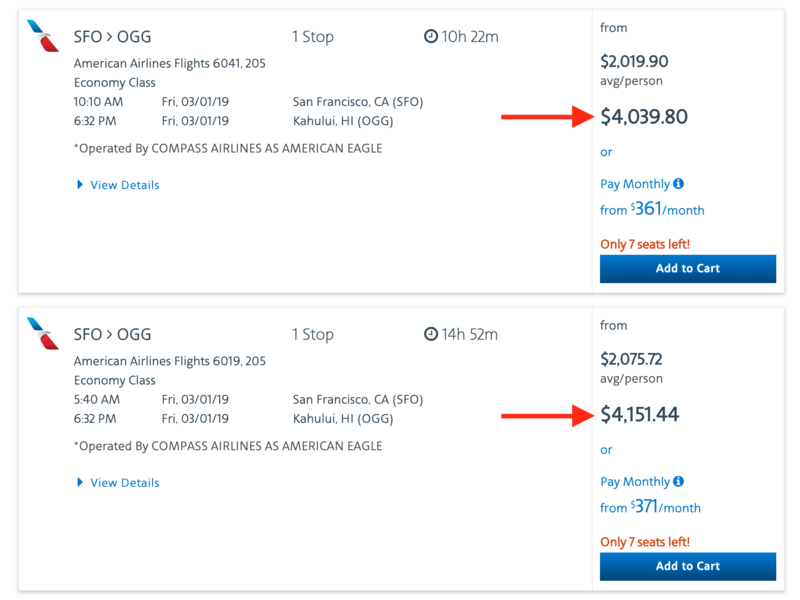 See how these 2 flights have different package prices: the first flight is included in the base package price, but the second flight increases the cost of the package. Right before completing your purchase, you will have the opportunity to add something you missed, like a car rental or activities for your trip. If you scroll down just a bit when you get to your trip summary page, you will see a list of available activities for your destination. Scroll through the activities or use the filter options on the left side of the screen. Most activities are priced per person, and some will have a minimum number of people required to book. 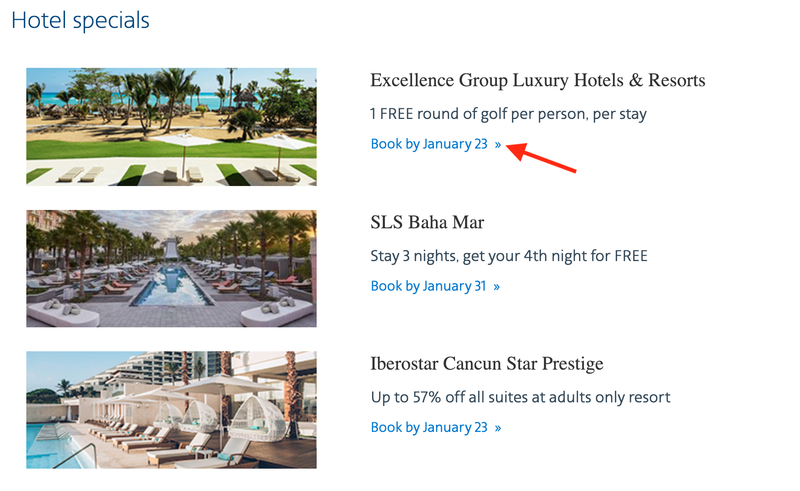 Once you have all portions of your vacation package to your liking, click on the blue Continue button to proceed to the payment section. The price you are paying will include taxes and fees, but will not include things like resort fees, checked baggage fees, or hotel parking fees. 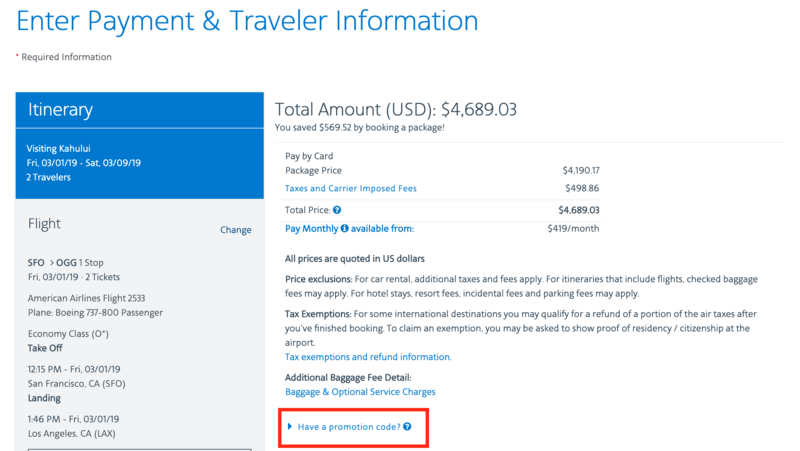 If you have an American Airlines Vacations promo code, enter it on this payment page. You will also be asked if you would like to add insurance to your package cost. If you are using a credit card that has an insurance benefit, there might not be any need for extra insurance. I use the Chase Sapphire Reserve® for all of my travel purchases for its great points-earning potential, plus the insurance that comes with the card. Hot Tip: Purchasing extra vacation insurance might not be necessary if you are using a good travel rewards credit card. Look for one that offers various kinds of insurance, such as trip delay, lost baggage, and travel accident. Check out our guide to credit card insurance to find the card that works best for you. Do you want to get away but aren’t sure where to go? Then head to the Destinations section of aavacations.com for some inspiration. You will see some featured locations, as well as a clickable list of all regions toward the bottom of the page. Click on any destination to see some sample prices as well as prices from your home airport. Just input your origin city in the search box. Remember that the prices you see will be per person. You will then be able to continue through your search as you normally would. If you are looking for a great deal, check out the Deals tab in the main menu. This is where you will find packages offering lots of extra miles or discounts, and sometimes even promo codes. There are also other sites that publish promo codes. If you scroll down a little bit on the Deals page, you will see a section titled Bonus Miles. This is where you want to look for those amazing deals offering lots and lots of bonus American Airlines miles! Of course, it helps to have some flexibility since these deals have specific terms — but if one of these deals works for you, jump on it. Who wouldn’t love earning an extra 10,000 or more bonus miles just for going on vacation! If you want to earn these bonus miles, do not use any AAdvantage miles to pay for your trip. Bonus miles will NOT be awarded on any package where miles were used toward the purchase of the trip. Bonus miles are awarded to the account of the first traveler on the reservation. Pay attention to the offer’s dates and details. You will have to book and complete your trip by a specified date to earn bonus miles. Hot Tip: If your package comes with a significant amount of bonus miles, do not pay for any portion of the package with miles. You must pay for the entire amount of your package using cash/credit card in order to earn bonus miles. Right under the Bonus Miles section you will find some additional hotel specials being offered. These offers can be anything from a free round of golf, a free night, or an extra percentage off the price. If you click on the “Book By” link, you will be able to see all the terms of the offer. Once you are on the offer details page, be sure to pay attention to the terms and booking requirements. There will also be a link to book your reservation. Be careful though, because there might be links to book other hotels as well. For example, this offer is for up to 57% off at the Iberostar Cancun Star Prestige. 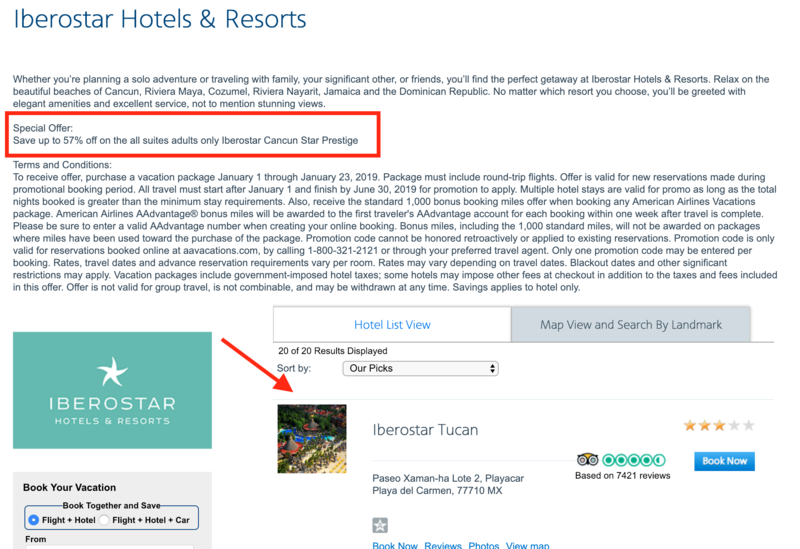 However, when you scroll down to book, ALL of the Iberostar hotels are listed — not just the one offering the discount. If you click on Hotels in the main menu, you’ll be taken to a page that lets you search by hotel brand. There are some featured brands at the top of the page, but if you scroll down you can see all the brands (plus a few individual hotels you can search for). You can click on any of the hotel links, then search for availability on your travel dates. Continue to book as you normally would. Hot Tip: If you are booking a chain hotel that offers a loyalty program like Hyatt, Marriott, or Hilton, keep in mind that you might not earn loyalty points when booking through American Airlines. Also, any elite status you have might not be recognized. If you are loyal to a brand and concerned about your hotel loyalty points and status, it’s usually best to book directly. This can be a helpful section when you know what kind of trip you’re interested in but aren’t sure about a location or specific hotel. 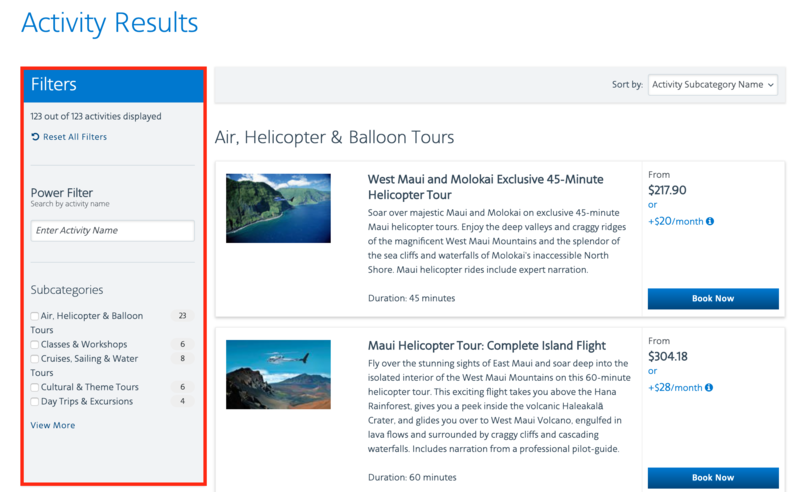 After selecting a vacation type, you will have a short list of results. Once you have made your choice, you can click on the hotel link for more information and to check availability for your travel dates. You only need to input your departure city and dates, and the correct airport will be automatically added. If you need to cancel your American Airlines vacation package, call 1-800-489-4810. Unfortunately, there will be fees associated with this, and some or all of your trip cost may be nonrefundable. If you are in a situation where there is a greater chance you would need to cancel your trip, you might consider purchasing a waiver to help out with the fees. Here’s where it gets complicated. I found 2 types of waivers on the AAVacations site: Cancellation and Change Waiver and the Pre-Departure Protection Waiver. However, you only have the opportunity to purchase the Pre-Departure waiver. The Pre-Departure Waiver was the only one that was available for purchase. Image courtesy of aavacations.com. I called American Airlines Vacations to clarify, and they couldn’t. The representative I spoke to told me they were the same thing, even though they differ online. Unfortunately, some hotels and airfares remain nonrefundable even when this waiver has been purchased. Any activities you have booked with your package are also nonrefundable. Another thing to note is that if 1 person buys a Cancellation and Change Waiver policy, every traveler on the same reference number will need to purchase one as well. This type of insurance offers fee waivers if your trip is changed prior to departure, or if name changes are made to a package at least 15 days prior to departure. However, there could still be other fees associated with changing your package — and again, some portions will remain non-changeable even if this waiver is purchased. The Pre-Departure and Protection Waiver cost varies, but most plans I saw were $69-$89 per person. Bottom Line: Overall I am unimpressed with the insurance options offered by American Airlines Vacations. The policies don’t offer much protection and come with lots of limitations. While some situations might make extra insurance a good option, most travelers will be just fine with the insurance that comes with their credit card. So, let’s get to the good stuff — can American Airlines Vacation packages save you money? For my first example, I priced out a week-long stay at The Buccaneer in St. Croix and round-trip airfare from Atlanta for 2 people. All prices are for the same room category, flights, and dates. As you can see, booking the package from American Airlines saves $168.14 over booking the flight and hotel separately, and even more over booking the same package through the hotel or Expedia. Expedia did offer a package that included the same hotel with a different flight for $4,185.98. However, the flights were terrible with multiple stops. Any packages from Expedia with flights that were comparable were more expensive. So, I would consider this a win for American Airlines Vacations. Here’s another one. 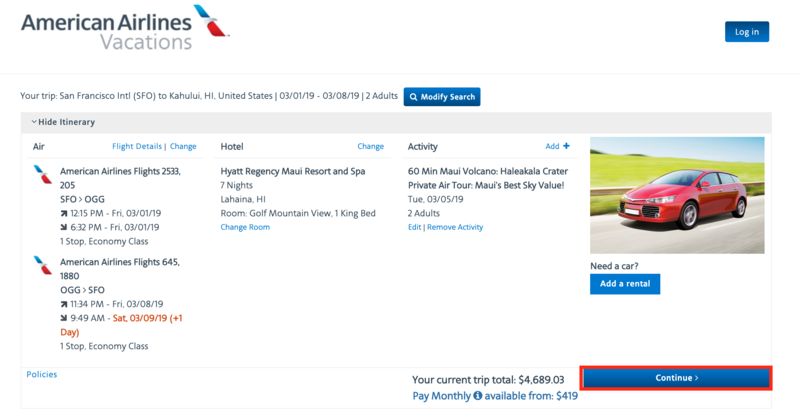 For this example I priced out a week-long stay at the Hyatt Regency Maui Resort & Spa in Hawaii and round-trip airfare from Seattle for 2 people. Again, the prices are for the same room category, flights, and dates. American Airlines Vacations is the winner again in this example. Booking through American saves $386.82 over booking the hotel and flights separately. It even saves money over booking a similar itinerary via Expedia with cheaper flights. I always suggest pricing out a vacation package to make sure you are actually saving money. However, it appears to be a good bet that you will get a deal with an American Airlines vacation package. In addition to flights, you can book an entire vacation package through American Airlines consisting of flights, hotel, rental car and even activities. American Airlines Vacations offers an easy-to-use website and low prices on packages. In everything I priced out, the package deal always saved money over booking a flight and hotel separately. So the next time you are ready to book a vacation, consider checking out American Airlines Vacations — you might be able to get a great deal! What kinds of packages does American Airlines Vacations offer? You can book a package consisting of any combination of flight, hotel, and rental car. You can also add activities to your vacation package. You will find hotels ranging from budget accommodations to luxury resorts. Where can I find American Airlines Vacations promo codes or special deals? On aavacations.com, go to the Deals tab to search for the current offers. You will find deals consisting of added amenities like free golf, bonus AAdvantage miles, free hotel nights, or a discount on specific hotels. Sometimes you will be able to find promo codes right on the website’s home page. What is the American Airlines Vacations phone number? You can contact American Airlines Vacations by phone at 800-321-2121 in the U.S. and Canada, and at 918-669-8977 outside the U.S and Canada. If you experience an emergency while traveling on an American Airlines package, call 800-901-9150 in the U.S, Canada, and the Caribbean, 1-877-809-2766 or 1-800-891-3818 in Mexico, and 918-669-8977 everywhere else. Can I use American Airlines miles to purchase a vacation package? Yes, you can use AAdvantage miles to purchase all or part of an American Airlines vacation package. However, you will not earn any bonus miles on a package if you use miles to pay for any portion of it. Do I need a travel agent to book an American Airlines Vacation package? No, you don’t need a travel agent to book an American Airlines Vacation package. Just go to www.aavacations.com to book your trip.